This was a number one country hit just over 40 years ago. Today I started reading John Denver’s autobiography. I’ve only made it through a couple chapters, but it’s very good so far. I love reading biographies of musicians. I think their creative process and interesting lives make for good stories. John became a pretty big phenomenon in the ’70s. I wasn’t around for the heyday, but even while I was growing up I for some reason remember knowing the words to John Denver songs. 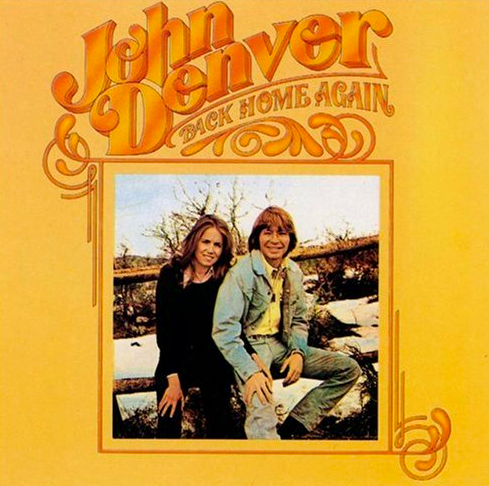 My parents would have been in their 20s during the ’70s so that’s a time when they probably heard John Denver on the radio quite often. And my parents would listen to all kinds of music from that era so maybe that’s where I picked it up. And I know John Denver songs were used in television and movies throughout my life. So after all that we’re throwing it back on this Thursday to one of John’s big hits, Back Home Again. This song kind of marks the really big rise in John Denver’s career. He had just started having really big hits, number one pop hits and crossover country hits. Take Me Home, Country Roads and Rocky Mountain High came out in 1971 and 1972, but it really wasn’t until 1975 that John Denver really became a mania in the music world. Back Home Again came out in 1974 and really propelled him into a huge 1975. It was a #1 song on the country charts and helped to win John two CMA Awards for Song Of The Year and Entertainer Of The Year. There was always some controversy over Charlie Rich’s award presenting that day, but I think that was overblown. Country was lucky to have John Denver as a part of the genre. If only we had more songs like his on country radio today. Maybe there is an opportunity there for a budding country star. This is a great song that is still interesting and appealing even today. Kind of a laid back song with happiness and gratefulness and yearning all rolled into one.